Morgan Newport delivers a pitch. The sophomore pitcher allowed just 2 runs over 7 innings in Northwestern’s lone win this weekend. Northwestern lost its final regular season series against Wisconsin this weekend, marking just its second series loss of the season. On Friday, the Wildcats (34-16, 14-8 Big Ten) lost their first game to the Badgers (27-20, 11-9) by a 7-1 score. Wisconsin jumped on freshman pitcher Kenna Wilkey quickly, scoring 5 runs in the first three innings. The deficit proved to be too much for the Cats, as they only managed to score 1 run off a solo home run by freshman second baseman Rachel Lewis. Lewis’ home run capped off an incredible regular season for her. Her solo shot against Wisconsin was her 17th of the season, and she leads the Big Ten with 59 RBIs. Coach Kate Drohan said Lewis has been a key piece in NU’s offense all season. In the second game on Saturday, Lewis stepped up once again, scoring 2 runs and driving in 1 to lead the Cats to a 4-2 victory. With a series win on the line Sunday, the Cats scored first off a Sammy Nettling double that drove in Lewis, but Wisconsin answered with 4 runs in the fifth inning. Although the Cats scored 2 runs in the sixth to cut the deficit 4-3, they couldn’t pull off the comeback. The story of NU’s weekend was the team’s inability to get hits. In the Cats’ two losses, they managed just six total hits, but they had eight in their win on Saturday. Drohan said the offense wasn’t “up to par,” adding she knows the Cats’ hitting is capable of more. On the pitching mound, Morgan Newport has become a reliable player to complement Wilkey. 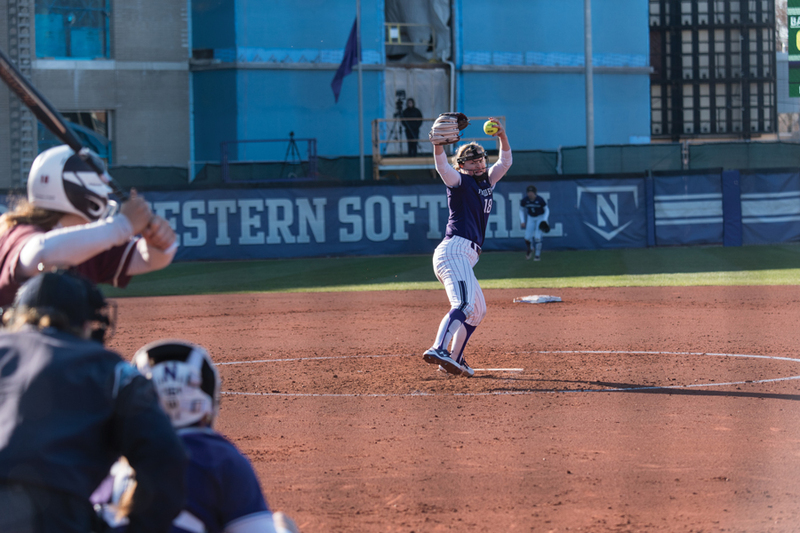 Newport pitched a complete game in NU’s win Saturday, giving up just 2 runs. Since a weekend series against Purdue in early April where she got only one out in two games, she has improved and dropped her ERA from 3.87 to 3.44. The Cats’ pitching staff finished the regular season with a team ERA of 3.66. NU’s offense finished with a team batting average of .291, third in the Big Ten behind Illinois and No. 12 Michigan. Despite the series loss, a Nebraska win over Illinois on Sunday helped NU still finish the regular season with the fourth-best record in the conference and secure a first-round bye in the Big Ten Tournament. For their season to continue further, Drohan said the Cats have to perform their best moving forward.